The six 22-minute episodes, use food as an access point to reconciliation. Red Chef Revival is a food and travel show that explores modern Indigenous cuisine through the eyes of three chefs—Cezin Nottaway, Rich Francis and Shane Chartrand. The six 22-minute episodes, available on Telus Video on Demand and on YouTube as of April 16, use food as an access point to reconciliation. In an interview with Windspeaker Radio, Chartrand tells Kimberley LaFramboise the show teaches about protocol, food systems, food security, relationships and ceremony. The shows also feature ingredients not found in your average cookbook, like bison heart, beaver tail, moose nose, seal and cougar. But it’s more than a cooking show, and puts more on the plate than just food. Chartrand says the relationship of food and ceremony goes hand in hand. Having dinner with your family around the table is ceremony. Having food is a celebration of such ceremony. “The whole process is ceremony,” Chartrand said. Chartrand is the first Indigenous chef to win the Gold Medal Plates culinary championships. He is the executive chef at River Cree Resort and is an active advocate of sustainable Indigenous cuisine. From the Enoch Cree Nation, he was a finalist on Chopped Canada Season 2. His upcoming cookbook, Marrow, will feature recipes from his people and will share intimate experiences as a Sixties Scoop survivor. Chartrand, the recipient of the NAIT Alumni Hall of Fame Award and Chaine Des Rotisseurs Plate of the Year Award, is featured in episodes 3 (Prince Rupert) and 5 (Blood Tribe). He said his travels took him from the familiar to places totally out of his realm. The shows are emotional, funny, but also serious. He said the shows will make people think. Chef Rich Francis is a culinary activist of Indigenous cuisine with strong views on reconciliation, colonization, diabetes, obesity and food sovereignty. He was born in Yellowknife. His mother is Haudenosaunee from the Six Nations of Ontario and his father is Tetlit Gwich’in from N.W.T. Francis was the first Indigenous chef to compete and place on Season 4 of Top Chef Canada He went to Stratford Chefs School in Ontario receiving the institute’s award for culinary excellence in 2008. 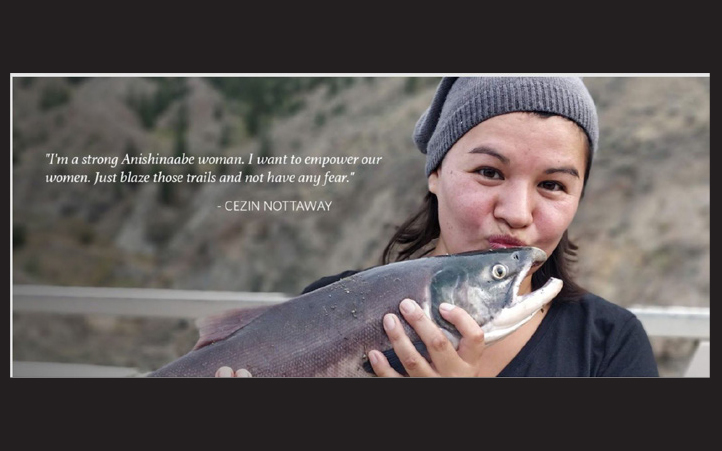 Chef Cezin Nottaway is owner of Wawatay Catering and is a new generation of chef, known as a master of bush cooking. She combines traditional cooking with a contemporary flair, while introducing Algonquin recipes, passed on to her by her kokom (grandmother). Cezin has been featured by the New York Times. She operates her business from Kitigan Zibi Algonquin First Nation (Maniwaki) in Quebec. Nottaway is a recipient of the 2016 Jeune Travailleur Autonome du Québec and Coup de Coeur Quebec. The world premiere of the docu-series will be held on April 16 in Toronto. Hot Docs Ted Rogers Cinema at 506 Bloor Street West in Toronto will host a screening of the first three episodes of Red Chef Revival. The event will also feature a taste of the food seen on the screen with the price of the $49 admission. It includes a special menu of appetizer, main, dessert and cocktail created by the chefs featured in the series. Doors open at 6 p.m. The meal will be served at 7 p.m. The screening will follow, as will an on-stage discussion with Chartrand, Francis and Nottaway. Tickets can be purchased at the Hot Docs Ted Rogers Cinema box office or at www.hotdocscinema.ca. Coming to grips with his inner demons, host Rich Francis travels to what he calls the ​Hollywood of Indigenous Reservations, ​Osoyoos, to cook with an ingredient he’s never used before, including cougar. In the aftermath of a massive wildfire in 2016, host Cezin Nottaway finds a deep connection between food and healing. Combining her signature bush cooking style with a traditional beaver tail recipe. Host Shane Chartrand explores the iconic North Pacific Cannery on Canada’s West Coast. A place where Chinese, Indigenous and Japanese communities converged. Struggling to connect with his own identity, Shane cooks a traditional seal meat stew, gets a hand poked tattoo and prepares a salmon tasting menu. Following an epidemic of suicides and gun violence, youth of Maskwacis are re-writing their future. Host Rich Francis finds new meaning to reconciliation by cooking moose nose ragu for the community and teaching the students of Nipisihkopahk School to make their own moose leg salad. Braving a recent breakup, host Shane Chartrand visits the Blood Tribe to cook a bison heart over an open fire. Combining rare zhylem syrup harvested from balsam poplar trees, a phenomenon which only happens once every three years, he finds new meaning in Indigenous cuisine. An annual deadly horse race brings host Cezin Nottaway to Nemiah Valley, an untouched backcountry in the interior of British Columbia. Struggling with her own insecurities, she finds a new sense of pride while learning to pit cook a deer and fire roast a salmon.